We believe each person is unique and that their care should match their individuality. A “one size fits all” approach doesn’t account for your unique health history and personal health goals. We have a variety of different techniques that we use in combination with each other to provide the most individualized and effective care we can. This is an instrument-based technique born out of the best and most recent chiropractic research studies. It is a low force technique that is delivered to the spine while in a relaxed and neutral position. Not only does an instrument allow the delivery of an adjustment to be incredibly gentle, it is also precise and specific in correcting points of neurological tension housed within your spinal cord. This is a manual-based (use of hands) adjusting technique that allows for restoration of intersegmental motion. We analyze the passive and active ranges of motion throughout the body to determine specific lines of correction. 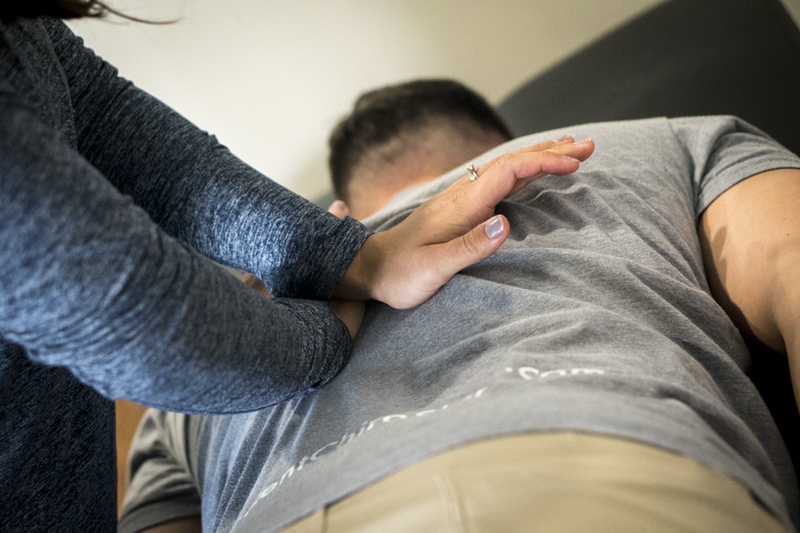 Upon determining that a joint is subluxated, or misaligned, we use a low force manual thrust to reset neuromuscular tone and motion segmentally. Manual adjustments are incredible for decreasing pain, restoring proper biomechanics, and establishing good posture. We look at all the joints in your body, not just the spine. We address shoulders, elbows, wrists, hips, knees, and ankles if needed. Because you are more than just a spine, we look at more than just your spine. And while your spine is your life source and the highway of communication to and from the rest of your body, the health of your spine is directly linked to the health of your extremities. Our number one priority is to establish proper global movement patterns. Establishing proper functional movement patterns is determined by having a well-alligned skeletal foundation and appropriate muscle recruitment patterns. Muscles that are not engaging appropriately, whether they are too tight or too weak, directly alters joint movement. Evaluating functional movement patterns during the initial assessment allows us to provide patients with individualized home care plans. Focusing not just on joint mobilization but also muscle re-education provides for faster results and longer-term correction of the underlying issue. Kids have spines too! And they daily stress them. Learning to crawl, stand, walk, and jump is no easy feat, not to mention playground bumps, bicycle bruises, and sports injuries. Developing a strong foundation early through gentle, safe adjustments with no twisting or “cracking” gives kids a chance to grow into health instead of waiting for sickness and disease to hit them. Chiropractic care during pregnancy is an effective and drug free way to alleviate pain. However, the benefits go well beyond just pain management. Research has shown average labor pains and delivery times to be reduced by up to 50% while under chiropractic care. We utilize a prenatal technique that focuses on sacral and pelvic positioning as well as alleviating any tension on the round ligaments to encourages baby to take an optimal fetal position as well as facilitating a natural labor and delivery.